SINCE the season started, PBA insiders haven't seen even just a shadow of Todd Purves. The former Asean Basketball League (ABL) champion coach had once been tagged as the savior of the San Miguel Beermen, brought in first as a coaching consultant and later tapped as a de facto coach in a bid to turn the fortunes around for an underachieving PBA team. But after his time in charge saw the star-studded team miss out on the Final Four twice, the likeable American coach has slowly faded from the scene, more so after his former ABL rival, Leo Austria, assumed the coaching reins for the Beermen prior to the season. 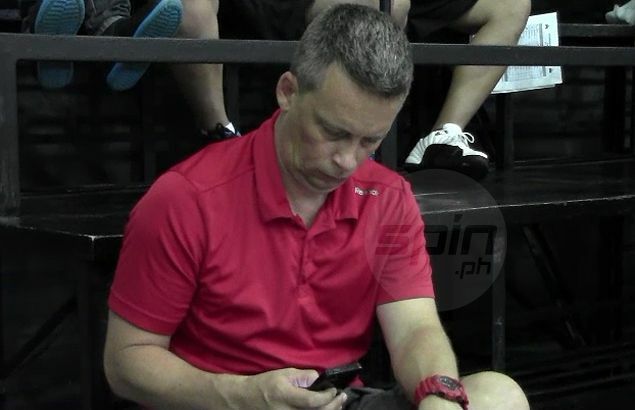 The former Sacramento Kings advance scout was last seen observing the PBA Rookie Camp months ago, but team sources Purves was only sent there only because Austria at that point was already focused on whipping the Beermen into shape for the coming season. So what's the status of Purves? "Nasa isang sulok na lang,” said a San Miguel insider who asked not to be named. “'Yung function niya sa rookie camp noon, parang nautusan lang 'yun. Kasi yung coaching staff led by Leo eh talagang focused na that time sa training nung team. Kaya siya ang pinatakbo sa rookie camp." Efforts by Spin.ph to get a lowdown from Purves went for naught as the former Indonesia Warriors coach is not answering calls. Another source said Purves has been reduced into a mere spectator in practice, although he is still around since he is still under contract with the Beermen until next year in a deal that reportedly pays him US$20,000 a month. “Parang nag slowly fade out na lang siya from the limelight. Pero andito lang 'yan. Hindi pa umaalis. Nagla-lay low, lay low na lang yan,” added the source. Austria lost his assistant-coach job at San Miguel when the American coach was designated as de facto coach with Biboy Ravanes the coach on paper last season. Austria and Purves also squared off twice in the ABL Finals, splitting the matches. Austria, however, denied that he has any beef with Purves, although he made it clear in a previous interview with Spin.ph that Purves' role in the team will depend on what the team needs. “Team consultant siya, kung may problema, lalapitan. Kung hindi, eh di mainam. Ibig sabihin maganda ang takbo ng team,” he replied. With the Beermen off to a hot start, there's obviously no need for Purves right now. Or perhaps in the future.